Imagine you have just been tasked to overhaul an ailing product or service, you could spend time improving all aspects, but this is time consuming and costly so how can you best channel your efforts to have the greatest impact? 1) We focus too narrowly on the product and service elements we produce, rather than seeing our product as part of a bigger system of shopping, usage, consumption, post consumption and disposal. 2) We broadly make incremental improvements rather than introducing game changing ideas that focus on an underlying category problem. One way to avoid a narrow or incrementalist view of your product or service is to look at your offering from a customer perspective. Examine how a customer interacts with your brand, product and category, see your product as part of a total experience even if some of the elements are beyond your control. It’s only by embracing the complex human experience of your product that you can be equipped to innovate elements of the experience to maximum effect. 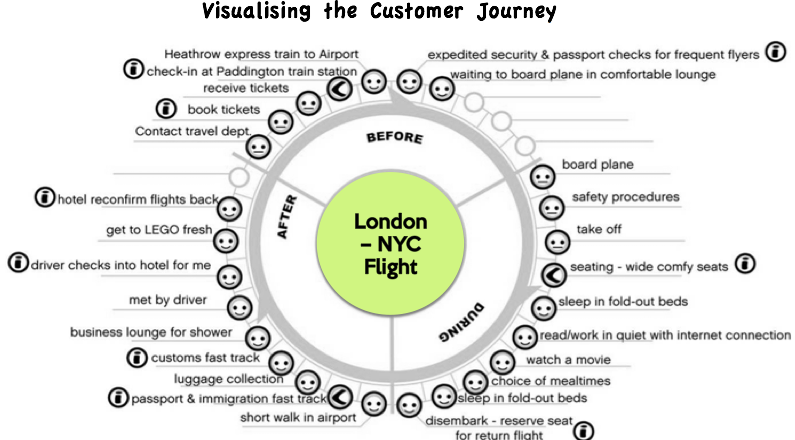 One of the best ways to examine the human experience is to Visualise the Customer Journey through the eyes of a customer. By visualising we are able to document the complexities of the customer interaction with your product and category and find opportunities. A good starting point is to document the journey by walking in the customers shoes and capturing the full pre, during and post journey photographically. 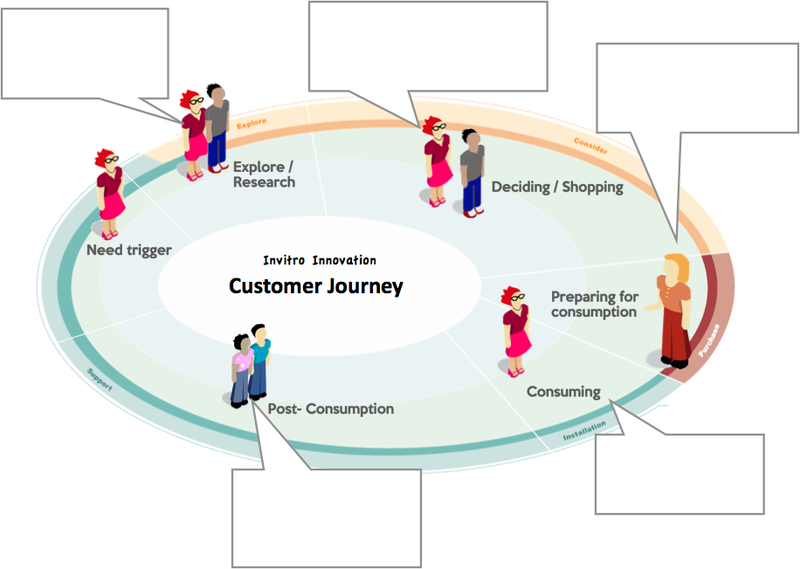 For each stage of the customer journey, identify the pleasure and point points that the customer may experience. The pain points become fuel for new ideas. It is worthwhile to take the customer journey one step further. 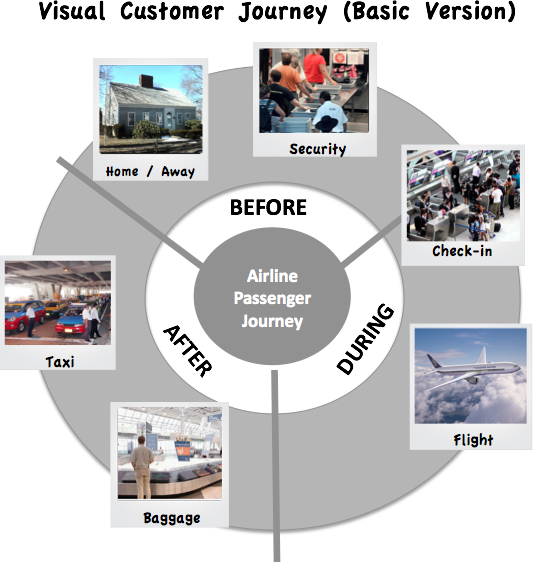 Once again visualise all stages of the customer journey but this time capture even greater detail. The value of visualising the Customer Journey is that we are able to breakdown the complexity within a system of experiences and SEE the whole customer experience with a hyper-clarity. It is this hyper-clarity or simplicity through visualisation that enables the kind of Vivid Thinking required for Innovation. Because not only are we equipped to innovate at each pain point we see the customer experience as a whole and are able to uncover some fundamental problems with the experience to aid a radical re-design. 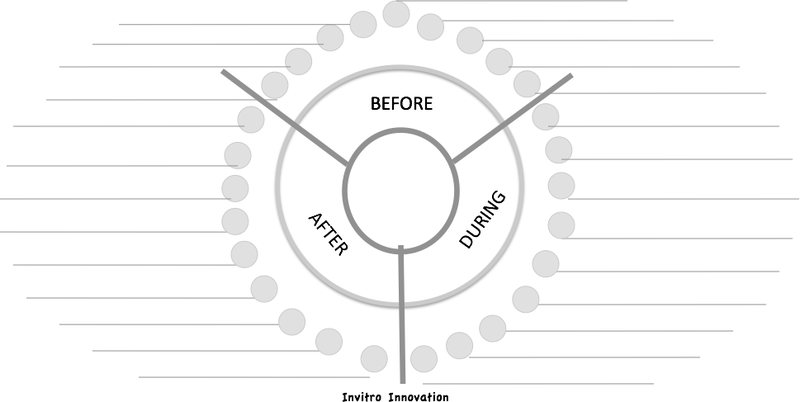 INVITRO is an Ideas & Innovation Consultancy that believes that breakthrough solutions are achieved by imagining rather than rationalising. And that fresh ideas only follow a fresh view of the problem. It's our mission to make business more creative in how they overcome problems and seize opportunities.